Facebook Live lets you connect with your Facebook followers in real-time. No editing, no fuss; just powerfully authentic engagement. Facebook Live went, well, ‘live’ to all Facebook users in April 2016. This was a statement straight from the top, underlining Mark Zuckerberg’s intention to dominate social video. Two years on and Facebook has posted a total of 3.5 billion Live broadcasts. Meanwhile, data from Socialbakers suggests that 80% of brands now receive higher organic reach with Facebook Live videos than with native videos. The following brands are killing it on Facebook Live and, with the help of our 10 handy tips, so will yours! Show and tell has been a powerful learning tool since the dawn of man. How do you think our early ancestors informed, educated and entertained themselves? They got around the fire and talked it out, face to face. Fast forward tens of thousands of years later and – guess what – we’re still doing it. Sure, we have YouTube now and glowing embers have been swapped for a screen, but live communication is just as important now as it was back then. Facebook Live is the perfect platform to connect with an audience first-hand. It feels personal, immediate and, with the right subject matter, can be enthralling. So how should you go about broadcasting on Facebook Live? Here are our top 10 tips for success! Image processing software developers, Lightricks, tapped into the ‘show and tell’ ideal with this interactive demo of their Enlight Photofox mobile app. Much like their software, the hosts layer up the detail to tell their story. Using a split-screen approach, a designer walks us through the functionality of the app, while his colleague fields and answers questions there on the spot. Lightricks have amassed a loyal fan-base and have realised that the best way to mobilise an army of followers is to keep them right up to date with their app’s best features. It’s a clever, quid pro quo approach that fosters loyal brand advocates who are willing to spread the gospel because they’re rewarded with something in return. Around 4,700 viewers were Enlightened (sorry!) by the Facebook Live broadcast, which also generated 109 reactions. TIP: If you’ve got a great product, then show it off. By giving your audience an in-depth tutorial about your product(s), you gain the dual benefits of an informed customer base who are more likely to recommend your brand, and what it has to offer, to their followers. Whilst Enlight’s Facebook Live broadcast largely relied on a great product to showcase, American diner behemoth, Denny’s, served up two extra ingredients that most viewing audiences find irresistible: humour and freebies! Their zany Facebook Live broadcast to promote their ‘Grand Slams’ breakfast range saw them subvert the usual Facebook Live formula by hosting a real-time quiz and swag bag giveaway…through an animated pancake presenter. Granted, it does sound flipping mental on paper. But it works! That’s largely thanks to clever scripting and comic improvisation. Pancake’s Facebook Live takeover attracted 13,000 views, 831 reactions and 71 shares for Denny’s. Their wider Grand Slam videos have gained more than 170 million views. That’s some tasty customer engagement right there! TIP: Engagement is a process of give and take. One of the best ways to make an audience feel involved is to address them personally. Facebook Live lets you interact on a granular level, right down to answering individual questions. Be genuine and consistent, and your interactions will flourish. Jumping on the quirky bandwagon themselves, Lenovo set about proving the durability of their ThinkPad X1 Yoga laptop in a novel fashion. Nothing proves their point better than subjecting a laptop to various sadistic torture acts chosen by their Facebook Live audience. Right?! Lenovo played the humour card brilliantly here. You’re drawn in with the promise of carnage, instructed to choose between increasingly silly choices of torture weapons (frozen fish vs ice block anyone?!) by hitting the ‘Like’ or ‘Love’ emoticons. Little wonder that they managed to generate an impressive 5,200 reactions from 86,000 views. If you were wondering how the laptop fared, it just about survived. But it did need to be subbed for a fresh one by the end! TIP: If you believe strongly enough in your product or service, then why not put your money where your mouth is and show the world just how good it is? Unlike the standard product demonstration, the point here is to go BIG to underline the efficacy of what you have to offer. Let your imagination run riot! Even LADBible themselves couldn’t have expected the heat they would generate for one of the most low-budget – but supremely effective – Facebook Live broadcasts ever. The ingenious premise pitched four iced confectionary heavyweights (a Magnum, Twister, Solero and Feast if you were wondering) against each other to see which would melt last. Really! Over the course of 36 strangely engrossing minutes the ice lollies slowly succumbed to the elements and perished in a sugary puddle until the ‘Last Lolly Standing’ was announced. Who’d watch that we hear you cry?! Quite a few people it seems, as this now infamous Facebook Live cast chalked up a whopping 6.4 million views, 153,000 reactions and 14,000 shares. A peak of more than 80,000 work-shy viewers watched live as events unfolded (unsolidified?!). TIP: The takeaway here is that high production values, huge budgets and hours of planning meetings aren’t always necessarily the best route to engagement. Sure, it’s important to plan your broadcast and create a buzz beforehand. But the key point is to keep it simple for the most effective results. For some people the only thing duller than watching ice cream melt is golf. But, for anyone with a glimmer of interest in the game, golfing brand Callaway pulled something special out of the bag with their Facebook Live broadcast from the office of one of the sport’s greatest icons – Arnold Palmer. The word ‘exclusive’ gets bandied about nowadays but this live cast truly did offer a unique experience that regular players couldn’t have got without this access all areas broadcast. Who could have known that aside from his seven majors ‘The King’ was also presented the Presidential Medal of Freedom and had more keys to the city than a locksmith?! If you can look past the continuous stream of ‘awesomes’ and ‘cools’ of the presenters, this is a fascinating user journey. TIP: If you can offer your viewers a glimpse into a lesser seen world then you too could line up some above par engagement. Take them behind the scenes with a VIP tour of your production space or event and you’ll gain a much deeper level of customer buy-in. If there are two things digital natives love, it’s self-made internet sensations and cake. Blogger/vlogger, Chelsey White, has bootstrapped her baking passion into a popular side hustle with her Chelsweets blog, YouTube channel and Instagram following. In this Facebook Live broadcast, Chelsey demonstrates how to make a four-tiered buttercream rosette cake. If the success of TV baking shows like Bake Off, Zumbo’s Just Desserts (and countless others) are anything to go by then we are unashamedly obsessed with gooey desserts. Chelsey and the Food Network tapped into the current zeitgeist with a straightforward, no frills demonstration video that generateed 276,000 views, 822 shares and 4,400 reactions. Not to mention 1,924 comments that veered from awestruck appreciation to condemnation for the lack of dowels in action (scandal!). 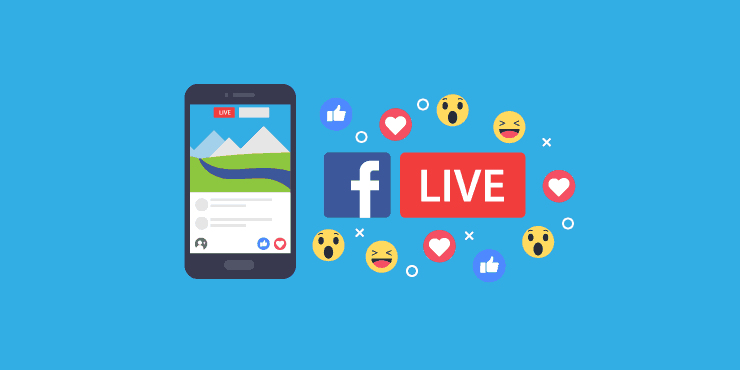 TIP: If you’ve got an expertise, then you can galvanise your very own Facebook Live following with a healthy portion of passion and personality. Use Google Trends and Quora to tap into areas that people are interested in and, if you can demonstrate some prowess, you could be on to a winner. LADBible aren’t the only ‘lads’ site who know how to milk a live event. Rivals UNILAD upped the ante with a heartwarming Facebook Live transmission from the Homeless World Cup final. Since the inaugural tournament took place in the Austrian city of Graz in 2003, inspirational charity, the Homeless World Cup Foundation, has been bringing together more than 500 players affected by homelessness from more than 50 countries worldwide in one week-long street football tournament. They use football to support and inspire people who are homeless to change their own lives and change attitudes towards people who are experiencing homelessness. UNILAD were able to give the tournament a platform, attracting 631,000 views, 10,000 reactions and 1,100 shares. In the process, Mexico’s 6-1 mauling of Brazil to claim the World Cup for the second year running brought a huge amount of attention to the cause. TIP: Conducting a Facebook Live broadcast from your event can do wonders for awareness of your brand, product or cause. As with any event, you’ll want to plan your broadcast well in advance and issue invites and reminders to get your audience excited and on board. If you’ve got an interesting figurehead who can talk charismatically in front of the camera then you’ve got the makings of a Facebook Live success. The New York Times took this formula to the Nth degree with not one but two Hollywood heroines to launch their ScreenTimes series of monthly filmed events. Journalist Logan Hill got the plum job of interviewing Academy Award–winning screenwriter, director and producer Sofia Coppola and actor and director Kirsten Dunst. Having worked together on three films, spanning back to 1999’s The Virgin Suicides (Coppola’s directorial debut), the pair share a genuine friendship that allows for an intimate and relaxed interview. Viewers were encouraged to pose their own questions, giving them a rare opportunity to connect with their screen idols. TIP: Even if you don’t happen to have Hollywood A-listers in your address book, if you’ve got an interesting interviewee who is knowledgeable in their field you can generate a groundswell of online interest. The opportunity to ask an expert burning questions about their field is a great draw card. As we’ve seen so far, Facebook Live broadcasts give regular online viewers rare access to people and places that would otherwise be out of reach. BMW used this idea to great effect with a Facebook Live broadcast from the Paris Motor Show to launch their new motoring concepts. As you’d expect, it’s a well-polished and glossy affair, with a host of BMW head honchos unveiling new i3, C Evolution electric scooter, MINI John Cooper Works Clubman and Concept X2 models. The combination of excellent speakers, slick audio visuals and responsive management of their comment feed meant that BMW created a Facebook Live event that felt both exclusive and inclusive at the same time. Online petrol heads notched up 278,000 views, 10,000 reactions and 806 shares. TIP: If you’re launching a new product, why not give your Facebook followers a world-first glimpse via Facebook Live. Build up some hype beforehand, mark the date and if you invite them they will come! Kings of content, Buzzfeed, know a thing or two about grabbing and holding our attentions. Taking a leaf out of the LADBible playbook for viral success, Buzzfeed conceived a cunningly simple Facebook Live idea with an explosive ending. How many elastic bands do you think it would take to make a watermelon explode? No, it’s not a question that kept us awake either. But it must have been water cooler chat at the Buzzfeed offices. Because two intrepid guinea pigs – dressed in all-white boiler suits and science goggles – were left questioning their life choices as they methodically placed rubber bands around a watermelon. This one’s a slow-burner but once you’re invested it’s nigh on impossible to draw yourself away from the inevitable, messy conclusion. Buzzfeed generated a remarkable 11 million views, 53,000 reactions and 17,000 shares as a result of this broadcast. The most important number of all?! We counted 677! TIP: It just goes to show that with a bit of flair and fun you can capture the imaginations of your audience. Brainstorm some ideas with your colleagues – nothing should be off limits! Ideally, you’ll want to pique your viewers’ interest with something a little bit out of the ordinary. Elastic bands optional! As you’ve seen, Facebook Live can be a great vehicle for promotion. Take some time to plan your concept, enlist your most charismatic and knowledgeable speakers and have some fun with it! Remember, it doesn’t have to be a high budget or high-brow either. It’s often the simplest ideas that are the most effective. If you’d benefit from further guidance about how to make a splash online, then download How to Build & Grow an Engaged Social Audience, our free ebook that’s packed full of insider hints and tips. 5 ways to Rock your Facebook Channel with Video Content.